Just a heads up, since this is a "blink and you miss it" kind of thing. I'll be posting a review after, but I wanted to give an extra shout out because of the brief (this weekend only) run. 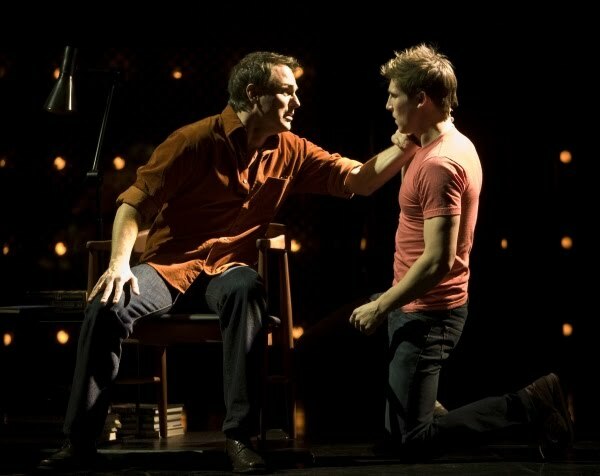 "Fe/Male choreographically hypothesizes on gendered power, intimacy, and joy. 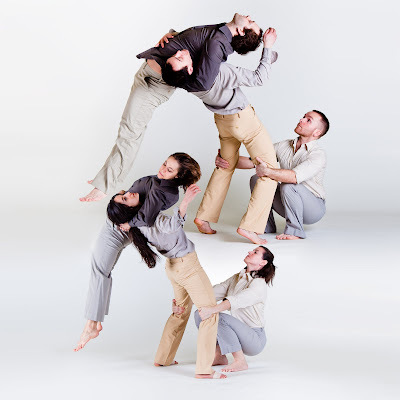 Repeating the same dances twice: once by an all-female cast and once by an all-male cast, Fe/Male seeks to uncover our preconceptions about the nature of gender. Choreography and direction by Jeffrey Peterson and Melissa Rolnick." 2-1 for the performances on June 4th and 5th. Returning to his boyhood home in western Ireland, young Father Padraig Bones is about to learn that in Famine Ireland, the truth is the first hungry casualty. “The Red Tureen”, a new musical to be presented by Eat Street Players at the Howard Conn Theater in Minneapolis, June 4-12, 2011, follows Padraig in his hungry struggle against British policies that turn food into a weapon. The fate of his beloved Kilkieran Valley lies in the balance. Bowen and librettist James Lundy, close friends since their days at Gustavus Adolphus College nearly thirty years ago, created “The Red Tureen” over the past five years. In abbreviated form at the 2009 Minnesota Fringe Festival, “The Red Tureen” was named a “Must See” production, and offered audiences “…history and mystery, but also the things singers love to sing about: romance, anguish, and humor” (Debra O’Connor, St. Paul Pioneer Press). 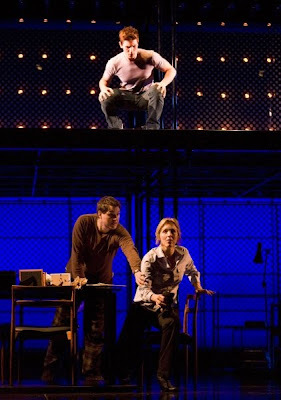 The current production premieres the story and music in their entirety. “The Red Tureen” is directed for the stage by Michael Sheeks, with musical direction by Andrew Kust, orchestration by Martha Davis, and dramaturgy by Jo Holcomb. “The Red Tureen” cast features Bill Marshall as Padraig Bones, Aly Westberg as Maeb McCullen, and Chris Deutsch as William Bones." I'll be reviewing that one, too, but again, just a little wave to let you know it's out there. 5/12/11 What Do I Tell My Goddaughter? I've had some inquiries about the T-shirt associated with my Vote No essay (What Do I Tell My Goddaughter?) so, having just ordered a couple myself, I can walk you all through the process. 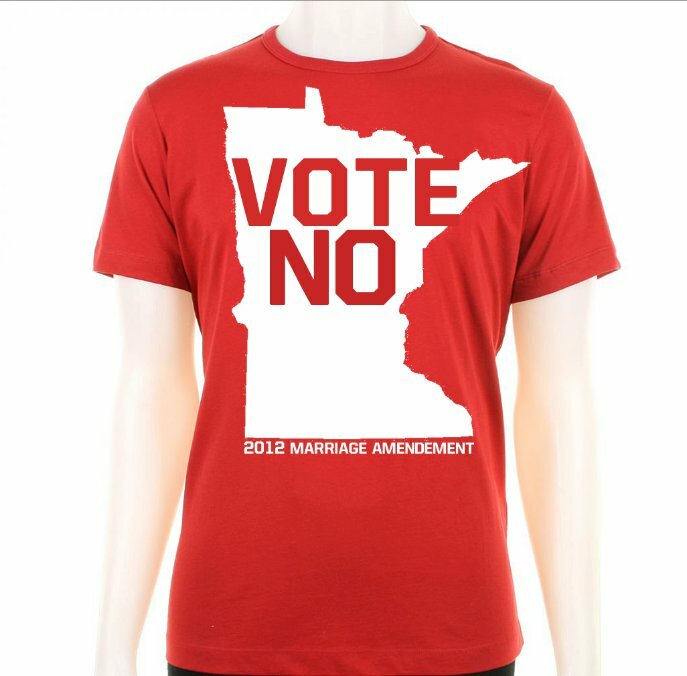 First, for those eagle-eyed proofreader friends of mine who noticed the first draft of the shirt misspelled "amendment" as "amendement" - the artist caught that and fixed it for the next test run. All shirts ordered will respect the laws of good spelling. The new photo of the T-shirt includes James' contact info (though the contact info doesn't actually appear on the shirt, fear not, just the Vote No art). Locally (Twin Cities area) he might be able to arrange an in-person pickup, so inquire if that interests you, see if your schedules align. Me, my schedule's too nutty right now. Mailing is best. It's worth the extra five bucks to me. He'll be processing payments through PayPal, which means you need to factor in an additional 3 percent to zero out their fees. Then you finalize your order and you're on your way. You get an email confirmation, and James follows up as well. All relatively painless as internet shopping goes. James does quality work, and I consider that price a bargain to rally for a good cause, and also support a local artist starting up a business. "Yeah, I noticed the ruling and it just makes me mad because I have known people that are/were planning to get married out of state. You shouldn't have to leave your hometown to do what you want to because of your sexuality. 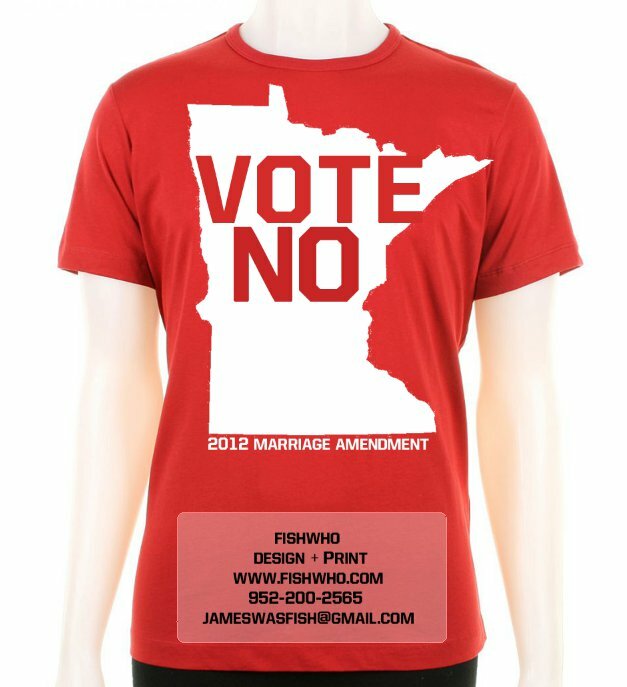 If there are any other social or political issues you feel NEED to be addressed, or like the idea with these shirts, please feel free to shoot me some input. I'm not doing this for the money. This is something I truly believe in, and I'm sick of the way things are governed in our country. Mob rule someday? Who knows. But if it's an idea I can back I will use all the equipment and skills I have to help get it out there!" Go, James! I know tons of great straight people. I don't know why it still (pleasantly) surprises me sometimes when they want to pitch in on behalf of a gay cause. I suppose they'd argue, "it's not a gay thing, it's a human thing." Guess I just figure somehow it's only "my fight." Nice to know so many people think it's their fight, too, regardless of where they fall on the Kinsey scale. You'll see my proudly wearing my red T-shirts around town soon. What Do I Tell My Goddaughter? Because she's going to want an explanation. What do I tell my goddaughter is the reason that in the state of Minnesota where her godfather lives, they are pushing an amendment to the constitution through the legislature to put it on the ballot for the November 2012 election? A popular vote to decide whether our constitution needs an amendment that would define marriage as being only between one man and one woman, and thus outlawing gay marriage? Because we already have a law on the books to this effect, correct? Minnesota already took care of that. So what do I tell my goddaughter? Why is it necessary to also add it to the constitution? Why is it necessary to put the rights of a group of citizens up for a vote? I heard a politician say that the good people of Minnesota are decent, caring, inclusive folks, and so they should be allowed to decide such a thing and not have the politicians or the courts decide it for them. But this politician isn't putting this amendment on the ballot because he thinks these good folks will reject anti-gay bigotry. He's expecting them to embrace it, and enshrine the traditional, exclusive definition of marriage into the state constitution. Is there a teeming hoard of gays and lesbians storming churches and the offices of justices of the peace demanding to be married and wreaking all kinds of havoc? I think someone would have told me. Does this amendment help solve any of our state's, or our country's, current challenges? Does it feed one hungry person? Does it educate one child? Does it put a roof over the head of someone who is homeless? Does it help shrink the budget and pay down the deficit? Does it bring one soldier home from the war? Does it help business to create jobs for the unemployed? Does it heal the sick? OK, then what do I tell my goddaughter? Because there has to be a good reason for it, right? Because when I stood up for her parents and spoke at their wedding back in June of 2004, my goddaughter's future mother and father didn't want to have a political debate or make anybody uncomfortable. But when I asked them if there was anything they wanted in this prayer, the bride told me that she had many friends, myself included, who were not allowed to be married. She wanted them to be a part of this day, too, and she wanted people to remember that inequity still exists. We need to recognize it, we need to fight it. We need to not silently accept it as the way things are. We need to fight for the way things should be. The wedding was in Taos, New Mexico, in the shadow of the Taos Mountain, a sacred Native American territory were non-Native Americans are not allowed to set foot. Hear us as we pray..."
including the ceremony we gather for today. and comfort for the dying and their families. and safety for those at war. better than we found them. This was the union into which my goddaughter was was born two years ago. These are her parents. These are their friends. They asked me to be her godfather because they wanted me to be involved in her life, to be an influence in raising her. So what do I tell my goddaughter about my adopted state? A state I moved to almost 20 years ago now to build a life. A state that has nurtured me and made me feel welcome and made me feel like the world was expanding and all things were possible. A state that now seems to be telling me the opposite. That I am not welcome. That I am not the same, or as good or deserving, as everyone else who lives here. That the things which I am allowed and not allowed to do can be called up for a vote at any time. That my rights are not inalienable. That some pursuits of happiness are not to be tolerated. What do I tell her when she asks me, "Why do you still live in Minnesota if they feel this way about you?" Tell me, please, because right now I don't have an answer for her. 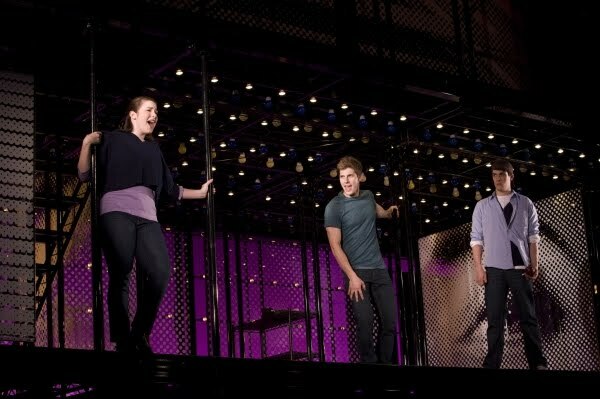 It takes a lot for a piece of theater to genuinely surprise me anymore. I've seen so much theater, and get involved in the nuts and bolts of storytelling and production myself with my own scripts. So when a theater production puts one over on me, and actually has me enjoy being pysched out, that's a rare and pretty neat trick. 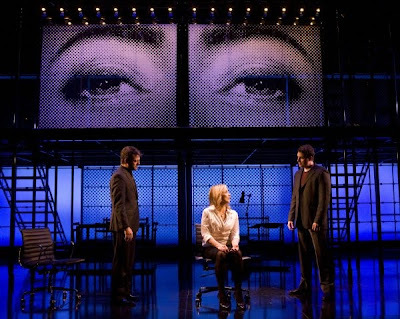 The national touring company of the Tony and Pulitzer Prize-winning musical "Next To Normal" surprised me not once but repeatedly throughout the evening. But "Next To Normal" isn't simply a cleverly rigged puzzle box. 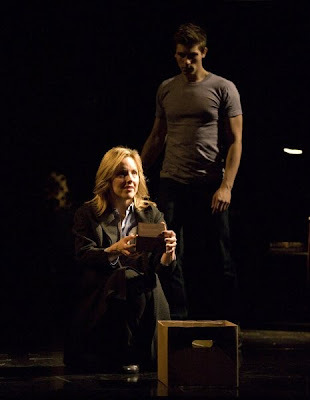 There's a deep emotional connection going on between the play and its audience as well. Just like I'm not often surprised anymore, I'm also not often moved - to laughter, to tears, to sighing, to sitting on the edge of my seat in suspense. 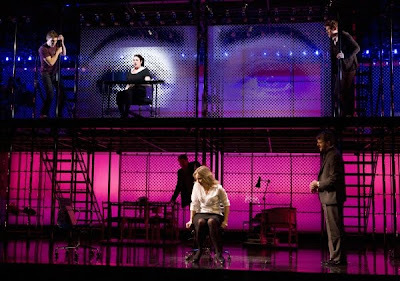 "Next To Normal" pulled all of that out of me, too - my heart and brain spinning at once. It's a gorgeous piece of theater. It richly deserves all the awards that have been thrown at it over the last few years. 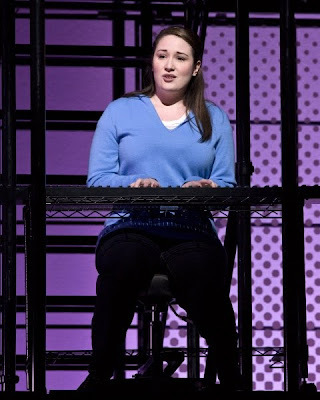 I hardly ever stand at the end of a play. When the cast came out to take their bows, the friend who accompanied me asked, "Are we standing?" We stood and applauded. I hardly ever buy a musical cast album, or libretto. 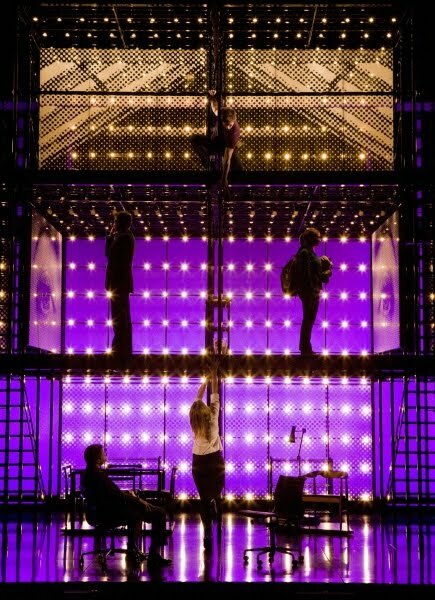 For "Next To Normal," I made a beeline for the merchandise booth - at intermission, before I even knew how the thing was going to end yet. I bought both. The music is powerful and lovely and has a lot of intriguing variety to it. The lyrics and libretto are funny and smart. The performances just keep knocking you back on your heels. Every time you think you have these characters figured out, they throw you another curveball. It's incredibly addictive. 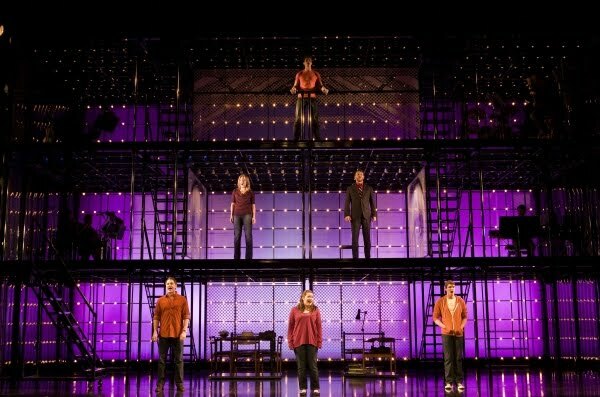 "Next To Normal" starts out as if it's going to be a rock musical spin on standard-issue suburban angst. 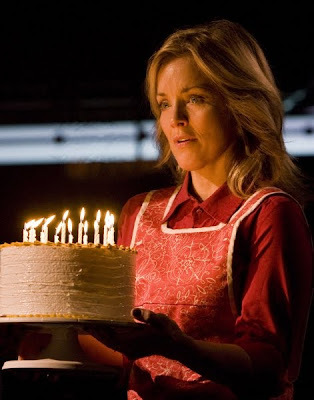 There's Diana (Tony winner Alice Ripley), who seems like a slightly overwhelmed wife and mother. 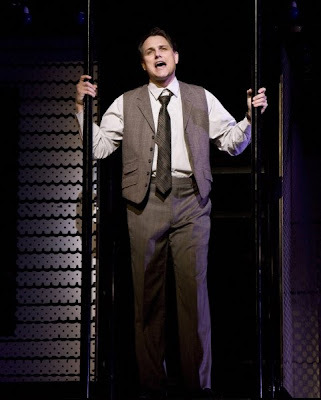 There's Dan (Asa Somers), who seems like a slightly clueless husband and father. There's Gabe (Curt Hansen), their strapping athletic teenage son. There's Natalie (Meghann Fahy during week one of the run here, Emma Hunton in week two), their socially awkward musical prodigy of a teenage daughter. The family's day starts normally enough, until Diana suddenly starts her own manic assembly line of sandwich making... on the kitchen floor. Diana is more than just a little overwhelmed. 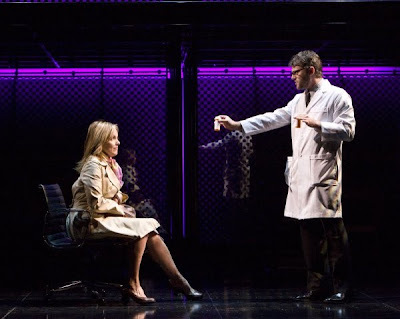 In fact, she has a series of doctors (the key ones all portrayed by Jeremy Kushnier) providing her with the necessary therapy and prescriptions to keep her on a relatively even keel. 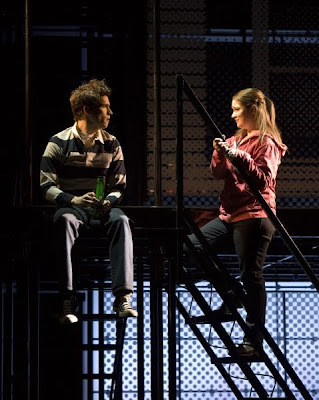 Daughter Natalie has attracted the attention of a genial slacker classmate named Henry (Preston Sadleir). Try as she might to keep Henry from meeting her peculiar family, eventually Henry gets pulled into an impromptu family dinner. And that's when the real whopper of a surprise gets pulled out. It makes the audience reevaluate everything they've seen up to that point, and spins the rest of the play off into much different territory. Let's just say Diana's problems go a lot deeper than garden variety suburban ennui, or even the phrase bipolar disorder. The focus of the family on Diana's problems has the unintended side effect of making Natalie feel more and more isolated, at precisely the time she starts worrying about whether what her mother has is a family gift that keeps on giving. Though classified as a rock musical, with a driving rhythm that keeps the story barrelling forward, the reason the Tony-winning score bewitched me so was because of its ability to incorporate other kinds of musical storytelling. Key moments of variety included a folk music lament by Diana ("I Miss The Mountains"), a melancholy music box waltz for mother and son ("I Dreamed A Dance"), and a love song by a husband for his wife ("A Light In The Dark") that was so beautiful it had me in tears, right as the play reached intermission. That last number isn't just beautiful because of the tune or the way it was sung, though both those assessments are true enough. It was another of those surprises I keep talking about. This is a love song where a man asks his wife to do something horrible in the hopes that it can save not just her, but their marriage, and the family. It's all the more lovely and horrible because the audience can feel him winning the argument, and none of us are entirely sure he should. Like so many pivotal moments in the story, it feels like both a victory and a mistake. How much emotion is too much emotion? How little is too little? How long can you grieve without endangering the rest of your life, or your sanity? If you can eliminate a painful memory, should you? How do you build a new life from scratch? Is it possible for something or someone which gives you comfort to ever be bad for you? How do you know when to let go, or walk away, and when to stand and fight? 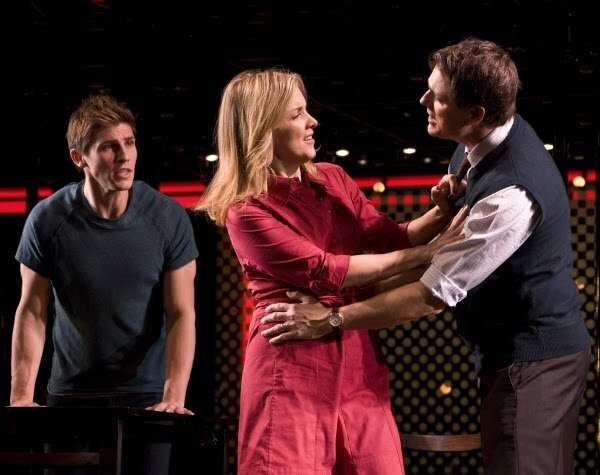 All these questions get teased out in the give and take between husband and wife, parent and child, lovers and friends - and the answers are intriguing, amusing, and constantly shifting, right up until the conclusion of the play. 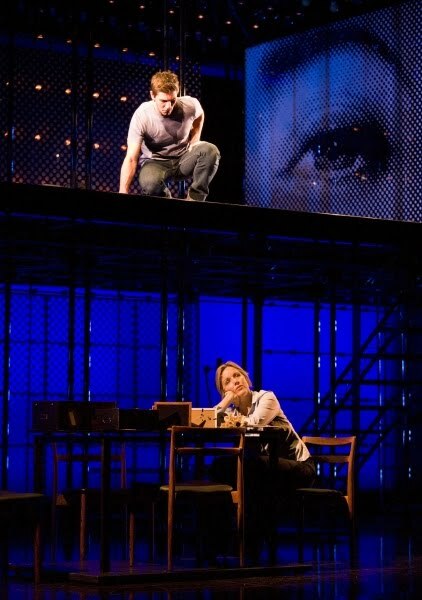 The vision of composer Tom Kitt and librettist/lyricist Brian Yorkey teeters so daringly (and often) at that place where the whole thing could go off the rails that my friend noticed me leaning all the way forward in my seat in the middle of act two. As if I were willing the play from where I sat, "Oh please don't screw up." My friend noticed not too long after that I had settled back in my seat again. Relaxed, knowing I was in very capable hands. Not just the hands of the authors, but the hands of all those great performers and musicians, and the Tony-nominated directing and design team. Michael Greif's nimble direction had that cast zipping up and down all over the wondrous three story set of shifting scaffolding designed by Mark Wendland, lit to dazzling effect by Kevin Adams. Spectacle was always in service of the story, never burying it or shoving it aside. It's wonderful and exciting to see something so different, and yet still so recognizably human. You should really see it for yourself. You deserve a surprise this good in your theatergoing life. I'm exceedingly glad they paid us a visit.